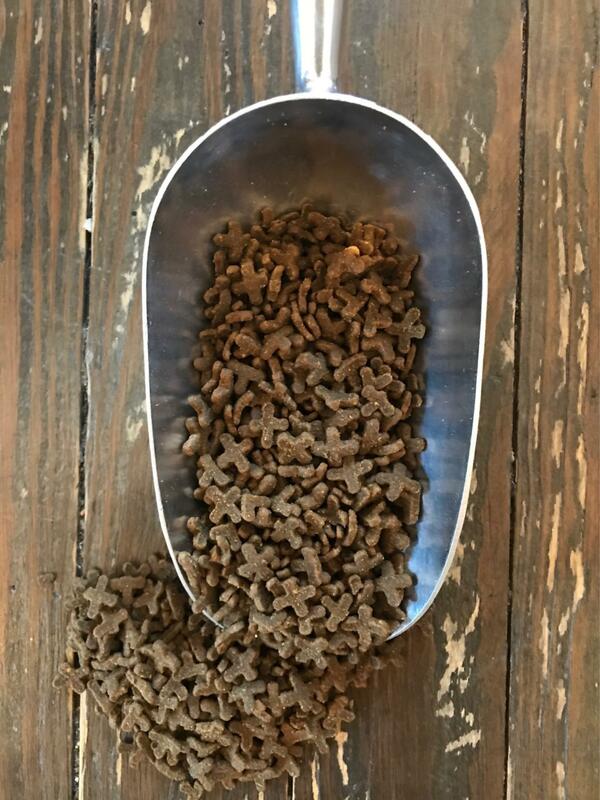 AAFCO Statement: Pet Wants Duck Meal and Herring Meal Recipe Grain Free Cat & Kitten Food is formulated to meet the nutritional levels established by the AAFCO cat food nutrient profiles for All Life Stage. Buy by the pound or by a 20lb bulk bag. Ingredients and feeding guide is in the long description. Pet Wants Duck Meal and Herring Meal Recipe Grain Free Cat & Kitten Food is formulated to meet the nutritional levels established by the AAFCO cat food nutrient profiles for All Life Stage. INGREDIENTS PANEL: Duck Meal, Herring Meal, Field Peas, Lentils, Canola Oil (Preserved with Mixed Tocopherols), Chickpeas, Tapioca Starch, Egg Product, Whitefish Meal, Pea Protein, Brewers Dried Yeast, Natural Flavors, Porcine Plasma, Menhaden Fish Oil (Preserved with Mixed Tocopherols), Lecithin, DL-Methionine, L-Lysine, Taurine, Yucca Schidigera Extract, Choline Chloride, Dried Cranberries, Dried Blueberries, Vitamin E Supplement, Niacin Supplement, Dried Seaweed Meal, Thiamine Mononitrate, Pyridoxine Hydrochloride, Riboflavin Supplement, Ascorbic Acid, Biotin, d-Calcium Pantothenate, Vitamin B12 Supplement, Vitamin A Acetate, Vitamin D3 Supplement, Citric Acid, Folic Acid, Ferrous Sulfate, Zinc Sulfate, Zinc Proteinate, Iron Proteinate, Copper Sulfate, Zinc Oxide, Manganese Sulfate, Manganese Proteinate, Copper Proteinate, Manganous Oxide, Sodium Selenite, Calcium Iodate. Up to 5 ¼-1/2 6-10 ½-2/3 Over 10 Add 1/8 cup for each additional 3 lbs. of body weight. Note: Feeding amount may vary based on age, activity level, and size of cat. Pregnant females should be fed up to 25—50% more in the last 3 weeks of gestation. Lactating females should be fed up to 2 times over guidelines Always consult a veterinarian if unsure. Always provide plenty of fresh clean water daily.